Tel Aviv:- DIAMOND dealers in Israel and Belgium are closely monitoring several indebted Indian diamond dealers and manufacturers. The implications for a global gem industry are potentially serious. According to estimates from Antwerp, Israel and London, global diamond debt is currently between US$12 billion and US$14 billion. Indian diamond dealers and manufacturers account for most of the borrowings. During an October interview in Tel Aviv, Eli Avidar, managing director of the Israel Diamond Exchange, said its members are conducting strict financial checks on Indian counter parties. An informed source from Antwerp confirmed that dealers and manufacturers in Belgium are doing likewise. Research and writing take time, but articles on this blog are free. They are there to give you in depth information and ideas. In return, kindly click the Jack of Diamonds Kindle Scout page. Jack of Diamonds is about diamond smuggling and fraud. Many readers believe that Kindle Scout, Amazon’s new publishing unit, should publish Jack of Diamonds. Please back author Neil Behrmann and nominate. If Kindle Scout publishes, you will receive a free book. See: initial reviews of Jack of Diamonds. Israel’s diamond debt has fallen from $2.4 billion to $1.3 billion, Mr Avidar disclosed. According to the Belgian source, Antwerp’s debt is also around $1.3 billion. Since India, Belgium and Israel have the world’s biggest diamond markets, the estimated Indian diamond debt is around $10 billion. Debt estimates in the opaque diamond world vary. Mr Avidar maintains that the size of Indian borrowings could well be higher. The Reserve Bank of India has disclosed that total doubtful bank assets – loans for all Indian businesses and individuals – amount to some $146 billion. In a telephone interview, Praveen Shankar Pandya, chairman of India’s Gems and Jewellery Export Promotion Council, said that he “didn’t think that borrowing (in the Indian diamond industry) is alarming”. Dealers and cutters have to pay mines cash for rough diamonds. They also must provide extended credit to polished diamond buyers, added Mr Pandya. So they need to borrow money, he said. The Kimberley Process, a mine producer and diamond market organisation that monitors conflict diamonds, also supplies statistics on rough natural diamonds. It stated that India imported 149.3 million carats worth $16.7 billion in 2016. The European Union (in effect Antwerp) imported 113.5 million carats worth $13.2 billion; and Israel 13.5 million carats worth $3.5 billion. Between 2015 and 2016, Singapore almost doubled its imports of diamonds to 4 million carats, worth US$1 billion. A carat weighs one-fifth of a gram. 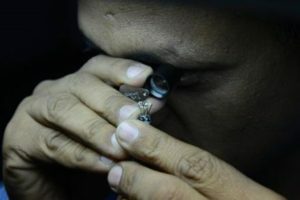 Due to its low labour costs, India became the world’s biggest diamond manufacturer. Diamond cutters and polishers have the skills to cut very small and cheap diamonds imported from Australian and other mines. Since 2009, Indian dealers and manufacturers have had “a strong advantage over Israel and Antwerp as they have received extensive credit”, Mr Avidar of the Israel Diamond Exchange, said. The industry currently employs 700,000 workers in Surat and Mumbai, estimates Sookshm, a New Delhi management consulting firm. During the 2009 global recession, after the financial crash, the Indian government feared that there would be diamond industry failures. It thus instructed state banks to triple credit in 2009. In subsequent years more loans were provided, according to Mr Avidar. While Mr Pandya sees no cause for alarm regarding the Indian diamond business’ debt levels, the Indian government’s policy has resulted in acute problems for the global diamond industry, Mr Avidar added. First, Indian dealers have used extensive credit to boost rough diamond purchases from De Beers, Alrosa and other producers. They have been outbidding dealers and cutters from Israel, Antwerp, New York and other markets. “During producer auctions, the Indians push up prices. To get (more) lines of credit, they must use it,” said Mr Avidar. He added that several Indian factories have required unlimited credit to keep going. The result has been a financial squeeze on manufacturers and dealers. They have either suffered declines in profit or incurred losses. Second, since Indian dealers and polishers were also squeezed, some over borrowed Indian firms have gone bankrupt. Others are finding it exceedingly difficult to repay debt, according to Israel and Antwerp dealers and bankers. Standard Chartered Bank, Belgian banking and insurance company KBC Group, Dubai and other banks have been hit by non-performing loans. Several Indian firms have also asked for debt forgiveness on a sizeable proportion of their borrowings, or asked for extended repayment terms, claimed Chaim Evan-Zohar, head of Tacy, an Israeli diamond consulting firm. Third, despite the arguments and counter claims, worries about potential dud Indian debt have caused banks to tighten credit. There are concerns that the industry, especially in India, should be more transparent. As a result, purchases and sales of all dealers and manufacturers – be they in India, Antwerp, Israel or New York – are being restricted. Fourth, the worry is that firms in financial straits could be forced to not only reduce orders, but dump diamonds. The result would then be a further decline in polished prices and also weakness in the rough market. Mr Avidar contends that the diamond industry must urgently increase marketing, to boost demand and bring down debt levels. “De Beers new advertising budget of US$140 million is a positive move but to increase sales and draw in new customers, the whole industry must advertise,” he said. This article was first published in The Business Times, Singapore. Neil is also author of anti-war children’s novel Butterfly Battle- The Story of the Great Insect War. The updated 2015 Waterloo commemoration version of Butterfly Battle is on Kindle and e-books. Book reviews are on neilbehrmann.net and Amazon and more reviews are welcome. If the books are purchased direct on this site, a proportion of the proceeds will go to low cost charities. Hello & Welcome to my blog. Besides the latest news and analysis at the front, you will find a variety of articles under “topics”. Please also browse through the book pages where you will find background and reviews. My latest book is Jack of Diamonds. Copyright © 2019 Neil Behrmann.